FWIW... Just upgraded -- at no cost -- to Verizon's 20/5 FIOS plan. Been hitting almost 25 megs pretty consistently today. I was on Verizon's 10/2 plan beforehand and the 5/2 plan before that. Didn't notice as much of a difference when I moved from 5 to 10, but jump to 20 is definitely noticeable on big file downloads. 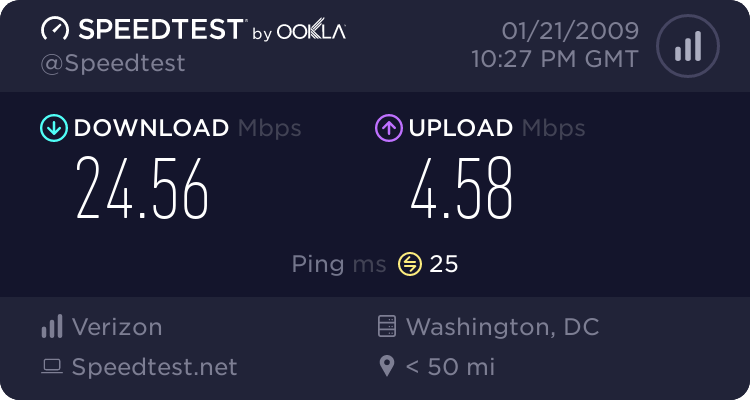 Cox Cable has also been offering nice speed boosts in my neighborhood (McLean, VA) recently, so I suspect that's why I was offered the free upgrade yesterday when I called Verizon about adding some new HD channels to my FIOS TV package.